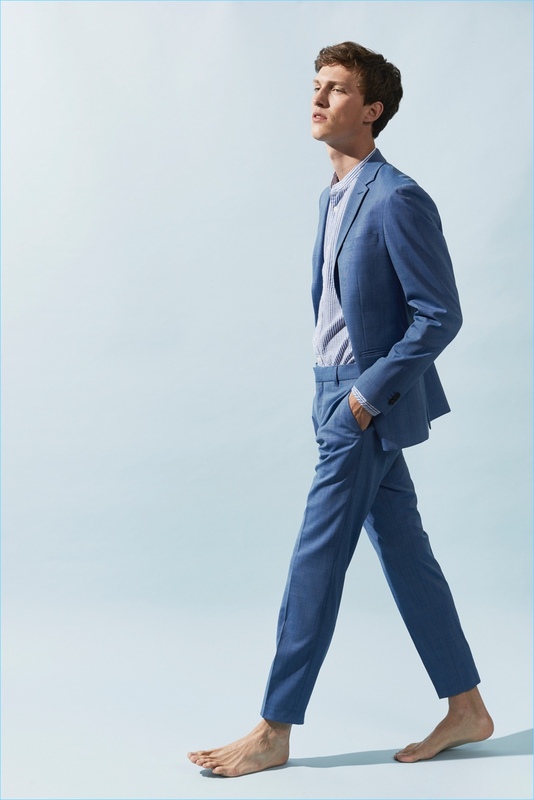 Sporting a sharp blue suit, Malthe Lund Madsen fronts Matinique's summer 2018 campaign. You might think that your suit is a complete look in itself, and while you may not be completely wrong, there are a few additions you can make that will take your suit to the next level. Getting the right suit can be a tricky business, so make sure you buy the accessories that are going to offset your look, not ruin it! If you’re not sure what accessories would look best for your suit, here are a few ideas to give you some inspiration. From traditional to modern, classic to unusual, how you accessorize your suit can let your personality shine through. When it comes to accessorizing your suit, keep your accessories to a maximum of 3. This means you won’t overdo it, or look like you’re trying too hard. If you have a waistcoat, this counts as one of your accessories so bear that in mind. Connecting with Simons, Rainer Andreesen wears a Gianni Lupo striped suit in navy. Meanwhile, Bo Develius dons a LE 31, shirt, suit, and tie with Steve Madden derby shoes. 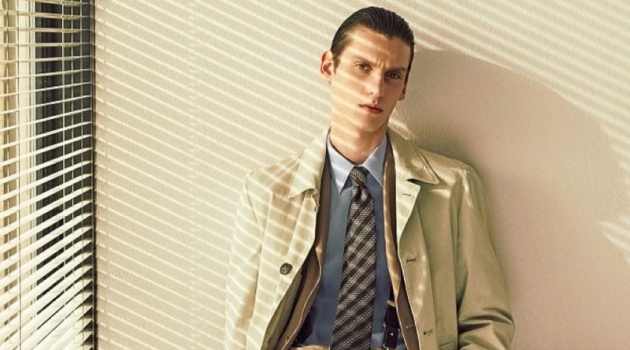 This is probably the most common and popular way to add some extra style to your suit. A tie is the easiest way to elevate your suit and give off a polished appearance; it will also give you a more formal edge if you’re going to a smart function. Choose your tie wisely; there is an unspoken rule that your tie should always be a darker color than your dress shirt. So, if you’re wearing a white shirt, you have free reign! If your shirt is colored, make sure your tie is at least a shade darker for a smart look. There is also a huge choice in patterns as well as color. Depending on the occasion, you may get away with a variety of patterns; a summer wedding could call for a floral tie, while a business meeting may require a striped or checked pattern for a more professional appearance. 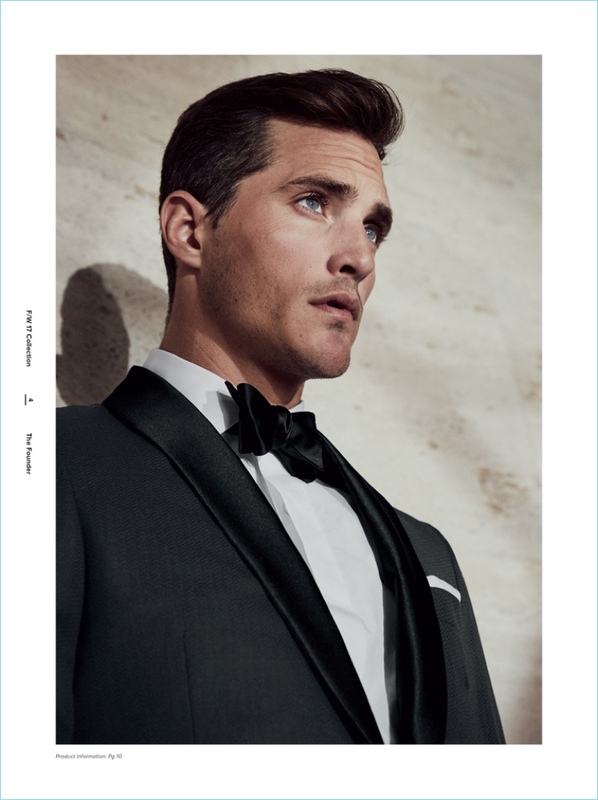 Ollie Edwards dons a sharp tuxedo jacket, dress shirt, and bow-tie from J.Hilburn. For a unique, distinguished look, opting to wear a bow tie could be a great choice to go with your suit. A bow tie can be worn to almost any occasion that requires formal attire, and it’s a little more eye-catching than your average tie. If you want to stand out, choose something like a red bow tie, but make sure the rest of your suit is simple. 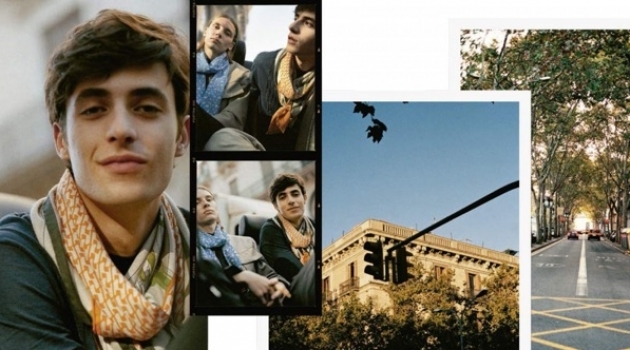 You can even experiment with paisley prints, polka dots or stripes if that’s your style. As a bow tie is relatively small, you can get away with being a little more liberal. 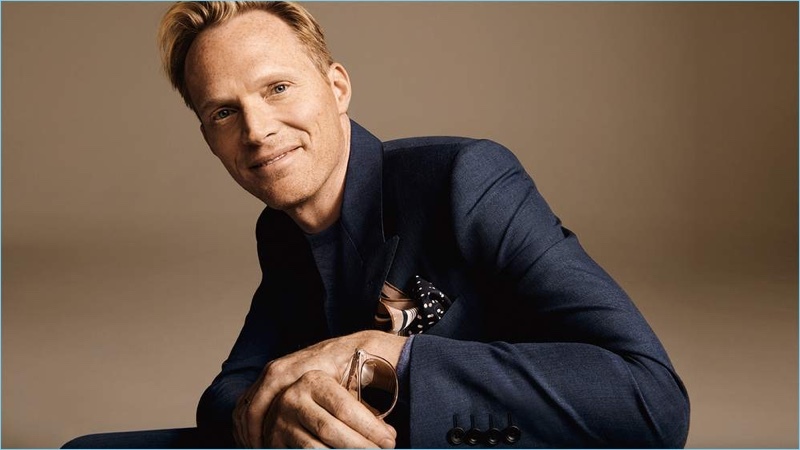 Starring in a Mr Porter shoot, Paul Bettany wears a Kingsman sweater and double-breasted suit jacket. He accessorizes with Saint Laurent sunglasses and a Dries Van Noten printed silk pocket square. Many people forget about pocket squares and view them as a style of an era gone by. However, adding a pocket square to your suit can enhance your suit beautifully and is by no means outdated. You can match your pocket square to the season; opting for a linen or cotton pocket square in the summer, with a tweed or wool pocket square in winter. Silk or satin are most versatile choices. Remember that your pocket square doesn’t necessarily have to match your tie; you can choose a contrasting color or pattern to create a unique appearance. Top model Jon Kortajarena wears a variation of Messika's Move jewels, the cufflinks. If you prefer a much more reserved and subtle style for your suits, there are plenty of other smaller accessories you can add. Sometimes these eye-catching details can work wonders. For example, dazzling cufflinks that are easily seen peeking out from under your jacket pocket, or a tie bar with a quirky pattern, can add some flair without being too bold. You can allow your personality to shine through these details. So, if you’re looking for a way to finish off your suit, accessorize carefully and create your very own look with up to 3 different additions.